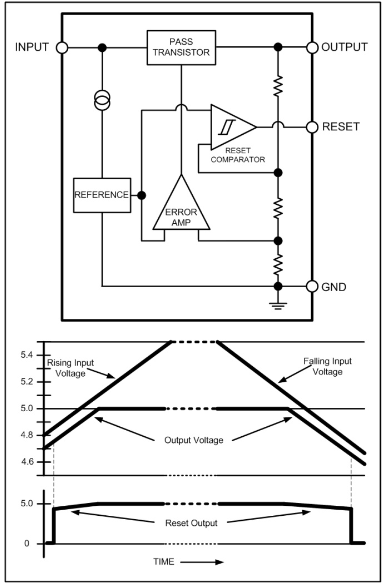 Supervisory reset delay prevents premature power fail resets, App note from ON Semiconductor. In today’s world of high speed, high power processors, new demands have been placed on the power source regulator. One example is the need to inform the processor in advance of an impending drop in supply voltage below a critical value. A common supervisory feature found in automotive LDOs is the Reset signal. When the input voltage is disconnected or lower than minimum operating voltage, the output voltage of regulator will decreases below the reset function threshold and the LDO activates a processor reset output. When an unanticipated Reset signal is received by the processor, important data is often lost because it has no time to save that data. This application note describes in detail the LDO Early Warning feature, which prevents the aforementioned loss of data by monitoring the input voltage and warning the processor in advance of an impending condition where a Reset signal will occur. This entry was posted on Sunday, November 30th, 2014 at 1:00 pm	and is filed under app notes. You can follow any responses to this entry through the RSS 2.0 feed. You can skip to the end and leave a response. Pinging is currently not allowed.